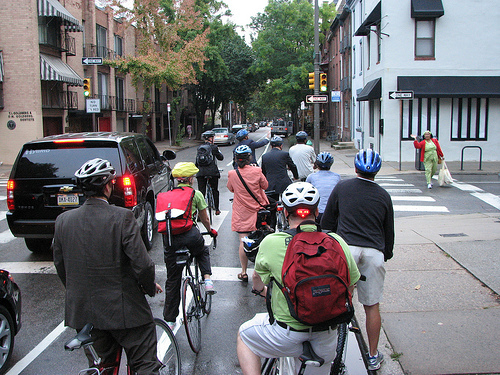 According to a recent report from the Philadelphia Bicycle Coalition, Philly is now the bike-commutingest big city in the U.S., with the most people riding to work per capita of any of the nation’s ten largest cities. Just weeks after the city’s bike progress made headlines, a city councilman has introduced legislation that could bog down further bike projects in politics and bureaucracy. Councilman William Greenlee wants to make every new bike lane in Philadelphia subject to a City Council vote. Requiring City Council approval of all new bike lanes is bad policy because: It will delay making our streets safer. Motorists, pedestrians and bicyclists have all benefited from the 46% reduction in serious car crashes on Spruce and Pine streets since the new bike lanes were installed. (While the cost to motorist convenience has been tiny: a 2 mph reduction in average speed.) No City Council approval is needed for new vehicular travel lanes, crosswalks or bus stops. Why single out a cheap, healthy way to commute? The City’s Bicycle and Pedestrian Plan has already gone through a public review process and been approved by the Planning Commission. When taking out a travel lane, the Streets Department already consults with the local civic associations. It doesn’t allow the traffic engineers at the Streets Department to do their job. Bike lanes installed as pilot projects will require review by City Council before the Streets Department can move the lanes to another street if that is what is recommended by their traffic engineers. Plan Philly is urging local residents to contact the City Council and voice their opposition to this bone-headed measure. Elsewhere on the Network today: Charlottesville Tomorrow reports that the local metropolitan planning agency is discussing reviving a decade-old, $161 million bypass plan despite questions about whether it is still, or ever was, necessary. PubliCola pans the design for Seattle’s new light rail station, which lacks mixed-use amenities and has been compared to an “airport terminal. And GreenCityBlueLake reports on an opposition campaign that has emerged in Cleveland after a casino developer proposed demolishing a historic downtown structure to make way for — what else? — parking.